Garden & Co, Granite Merchants traded in Aberdeen from 1874 to 1963. James Garden was born in 1817 in Auchterless, Aberdeenshire (about 30 miles north west of Aberdeen city). The 1851 census shows him then living at 76, Gerrard Street, Aberdeen as a ‘road contractor’. By the 1861 census he had become a ‘stone polisher’, and the 1871, 1881, and 1891 censuses continue to show him as a stone or granite polisher. He died in the poorhouse in 1894 of ‘senile decay’ (possibly due to his wife’s death). He married Mary Stuart (sometimes spelt Stewart) in 1841. She died in 1893. James’ eldest son, William Garden, was born in 1844 in Aberdeen, and by the 1861 census he was shown as a ‘granite mason’. By 1871 he had moved next door (No 78) to his father, and he died in 1886 of ‘congestion of the brain and convulsions’. It would appear that the only one of William’s children that became involved in Garden & Co was George Garden (1868 - 1912) who worked as a stone cutter. James’ second eldest son, James Stewart Garden, was born in 1847 in Aberdeen, and by the 1871 census he was shown as a ‘mason’ living with his mother and father. The 1881 census shows him away from home at Crieff, Perthshire as a ‘granite merchant’ presumably selling the company’s products. He also died in 1886 having had cirrhosis of the liver ‘for several years’. There is no record of James having had children. William and James Stewart Garden founded the company in 1871. The Aberdeen Directories show they traded at Gerrard Street, Aberdeen (the same street in which they were living) from 1874 to 1879 as James Garden & Co, thereafter just Garden & Co from 1882. First address listed is Gerrard Street (1874-75), then 67 Gerrard Street (1875-77) before moving to King Street (1879-80) and remaining there. Note that the map shown below is from 1866, so the King Street site must have either had a previous Granite merchant located there prior to Garden & Co moving in, or alternatively this was where the company operated from without actually being registered. Also note that they were living at 76 Gerrard Street in the 1851 census, so they were in the granite trade in Aberdeen before forming their company. 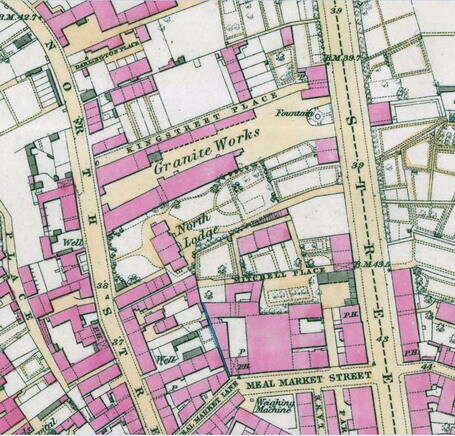 Gerrard Street is about 250 yards to the north west from the granite works shown on the map below. As both brothers died in 1886, it is likely that the running of the company passed either to their father, James, or alternatively to their uncle James Stewart Snr, or possibly to their cousins William Alexander and James Stewart. 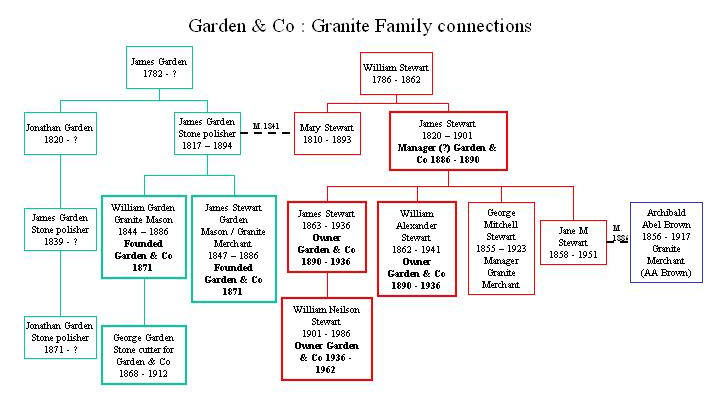 On the death of James Garden in 1894 there appears to have been none of the Garden family still involved in managing the business, although several other members of the extended Garden family were involved in the wider granite trade, with some in the company. Garden & Co Granite Works between King Street (on the right) and West North Street (on the left). Now the site of a supermarket. James Garden (b1817) married Mary Stewart from Huntly, Aberdeenshire (about 15 miles west of Auchterless)in 1841. Mary Stewart’s brother was James Stewart senior. In 1861 James Stewart snr (born in Forgue, Aberdeenshire in 1820) was recorded as doing stone repair work at Darnford Durris and Burn of Dykes (SW of Aberdeen).He died in 1901 of acute bronchitis. The 1881 census shows him as a Mason Foreman, and the 1891 census records him as a retired Manager of Granite Works. James Stewart snr had 6 children. Amongst them were William Alexander Stewart, born 1862 in Skene, Aberdeenshire; and James Stewart Jnr, born 1863 also in Skene. By the 1881 census the Stewart family had moved to Waterloo Quay, Aberdeen. In 1890 a ‘Mr Stewart’ represented the company at the Aberdeen Granite Association. As their father had retired by 1891, it would appear that the 2 Stewart brothers had taken over running the business. From 1925 to 1929 James Stewart jnr drew £1885 2s 10d from the business, and William Alexander Stewart drew £1186 6s 4d. James Stewart jnr died in 1936, whereupon the company passed to James’ son, William Neilson Stewart, who continued to run it until he wound it up in 1962. At the end of the 19th century Garden & Co were recognised as one of the foremost in the granite trade, not only in Aberdeen, but also as one of the largest such concerns in the world. Registered as a joint stock company in 1940 at 213-251 King St. First entered as a limited company in the Aberdeen Directory in 1941-42. Last entry 1962-63. King Street premises purchased in 1892 for £2000. On the 25th December 1902 a 10 ton crane fell over, crashing through the polishing mill roof. A fire severely damaged the polishing mill in 1916. Garden & Co awarded a silver medal at Paris International Exhibition in 1900. Garden & Co exhibited a very nice monument made of Scottish pink granite, and a display of twenty-one samples of rocks extracted from the quarry used by them. 4 July 1893: "anxious" meeting between deputation from AGA and company with some concern as to whether Garden & Co was to remain part of employer's association. Garden & Co., The Victoria Granite Works, King Street, Aberdeen. The house in question was founded in 1871 by Messrs, William and James Garden, and in the year 1882 the title of Garden & Co. was assumed. The premises occupied comprise a large yard, covering an acre of ground, with various buildings devoted to the several departments of the business. The offices are spacious and well appointed, and contain excellent accommodation for the draughtsmen and designers engaged in the establishment. There are numerous dressing sheds, equipped with turning lathes, sawing machines, and other apparatus for the cutting, shaping, and dressing of granite, these being all driven by a powerful steam engine and boiler. In the yard itself are stored tons upon tons of granite, and Messrs. Garden & Co. have facilities for the execution of every conceivable kind of work into which, this valuable material can enter. They have specialities in monumental work, their designs in this connection being eminently artistic, while the workmanship is not to be surpassed in fineness of finish; and the house has long been noted for its superior productions in polished archways, pilasters, columns, and building fronts, and in foun­tains and other manufactures of a similar character. Messrs. Garden & Co. also do a large business as polishers to the trade, their working facilities being of a very superior character and not equalled by smaller firms in this line. This superiority is especially noticeable in the matter of polishing carriages, lathes and saws, which have all the latest improve­ments, and of which Messrs. Garden have particularly fine equipment. Altogether this house must be regarded as one of the foremost in the granite trade - indeed, it has a recognised position as one of the largest concerns of the kind in the world. Its trade extends to every quarter of the globe, and a very large export business is done, the firm making their own shipments direct to customers everywhere. A most valuable connection is maintained at home and abroad, and the house enjoys a splendid commercial reputation, based upon the honourable, straightforward, and business-like manner in which all its affairs are conducted. Upwards of 250 skilled hands are regularly employed, and Messrs. Garden & Co. are actively represented by an agent at Sydney, New South Wales, where they have many customers. ~ Made the granite cairn in 1924 for the 51st (Highland) Division Memorial at Beaumont Hamell, near Ypres. ~ The memorial gate at Kirkwall Cathedral. ~ Design and manufacture of the John Wycliffe Obelisk at Lutterworth, Leicestershire, between 1894 and 1897. (Cost over £400). ~ Construction of Foveran War Memorial Aberdeenshire, unveiled in 1922. ~ Supplied the granite for the rebuilding between 1895 and 1899 of Jamaica bridge in Glasgow. ~ The Parish of Auchterless War Memorial, unveiled 27 June 1920. ~ An ‘elaborate doorway’ for Messrs Barclay & Company’s Bank in Yorkshire in 1903. Made from Peterhead granite and bears the letters BB. ~ A monument erected in 1892 in in Llanwonno Churchyard, Glamorgan to the memory of Glanffwrd, A Welsh bard ‘of some note’. In 1894, A monument for Mr WP Hartley erected in Colne, Lancashire. In 1916, a memorial for James Milne erected in Drumlithie Churchyard. In 1892, a monument to Lady Elizabeth Grey, for her grave at Morpeth. In 1921, The Laurencekirk War Memorial, cost £700. Stewart: There was another granite business named “Stewart” located in 1890 at 35 Charles Street. (Formerly Stewart and Cruickshank). Later relocated to the Bon Accord Granite Works of 27 - 49 Fraser Road. Registered as a joint stock company in 1915. Known to be involved in this company were Henry Stewart, William Stewart, and William Stewart Jnr, although no family connection has been found with the Stewarts managing Garden & Co.
AA Brown: The granite business of AA Brown was owned by Archibald Abel Brown (1856 - 1917). He married Jane M Stewart (daughter of James Stewart Snr, neice of James Garden and Mary Stuart). AA Brown’s granite business was based at Advocates Road from at least 1915 to 1940.